Rising from a deep sofa, walking over rough slope or stairs; if your legs are paralyzed, you will give it up. The student team Project MARCH of Delft University of Technology wants to change this and are working to build a new exoskeleton this year. This is a supporting frame that is worn outside the body. With this new medical technology development, we help paraplegics to perform their daily activities again. 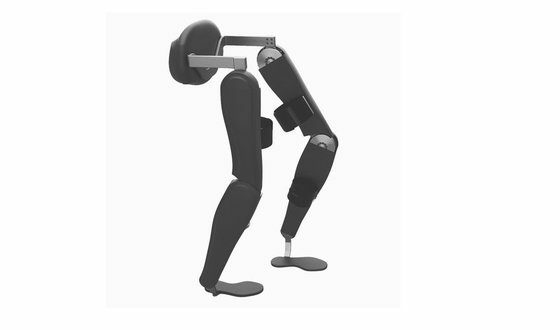 On Friday, March 24th, Project MARCH revealed the design of a new exoskeleton at Delft University of Technology. Martin van Rijn, Secretary for Health, Welfare and Sport, was present and talked to the spinal injury patient who is part of the team. The students find it important that people with SCI have an additional tool alongside the wheelchair. That’s why they make this contribution to this emerging technology. By building a user-friendly and versatile exoskeleton Project MARCH wants people with SCI to run again. “That is very important because this increases the movement of the user and improve social contact, for example, family, friends and colleagues because they are able to communicate at eye level with each other. The use of an exoskeleton has great benefits for the physical and mental state of the user. We are very proud that we have presented the new design on March 24 to the outside world. ” says Donald Dingemanse, the team manager of Project MARCH. The new design focuses on two main focus points: a joint compact design and a user-friendly feedback system. The design presentation not only unveiled the new design, but also highlighted the social importance of this technological development. Martin van Rijn, Secretary of the Ministry of Health, Welfare and Sport discussed about the current situation of exoskeletons in health care and in society. Ruben de Sain, the paraplegic patient who work with Project MARCH, was also present, discussing other capabilities in the areas of health insurance, crowdfunding and the future development of the exoskeleton. Both Ruben and Martin van Rijn concluded that exoskeletons have a promising future prospects, especially if we work with the right parties. “A future with exoskeletons, that’s what we should go for” says Ruben. This also requires more experience and research. “The student team Project MARCH can play a role in gathering more research data on the operation of exoskeletons, in order to gain a better understanding of the value of this technology compared to existing features as the wheelchair” says van Rijn. Project MARCH hopes to take a step in the right direction with their new design this year. Project MARCH has already developed an exoskeleton in the past. In September 2015, the project was established by students of Delft University of Technology and the first exoskeleton MARCH I was built. Each year a group of students will be a year full-time work to improve the technology in exoskeleton. After the hard work of the first year, there was room for improvement and also technology in many areas could still be optimized. Therefore, the new team since September 2016 design challenge entered a completely new exoskeleton, the MARCH II. This is the design that was presented on Friday, March 24th. Here were two main focus points for this year forward. The way in which power is transferred from the engine to the joint so the pilot can stand up and walk in different ways compared to last year. The design that has been chosen this year is a lot more compact. Another focal point is the feedback system. The feedback system ensures that the spinal cord injury patient in the exoskeleton knows where his legs are. He needs this feedback because he can not feel and know where his legs.